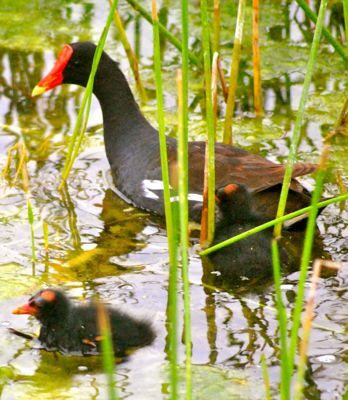 Moorhen and chick, photographed at Green Cay Nature Center in Boynton Beach. They aren't called common moorhens for nothing. If you go to a wetland and don't see (or at least hear) a moorhen, then you're not looking (or listening). 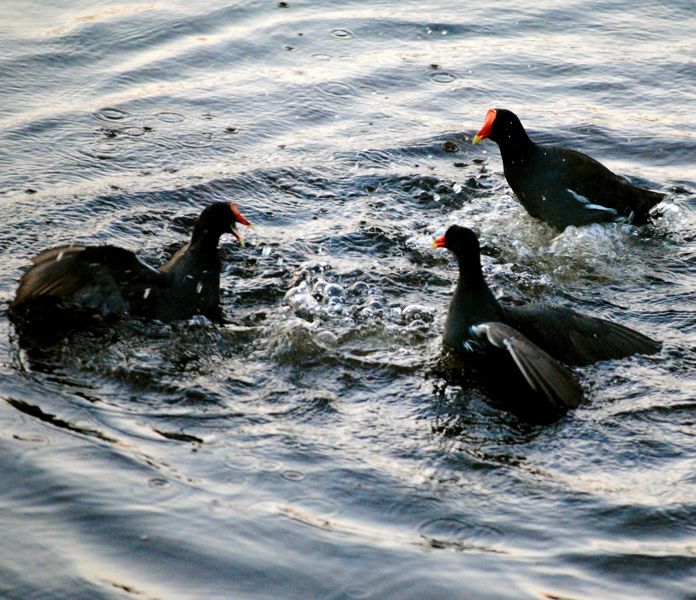 Moorhens, Gallinule galeata, arguably are South Florida's most common waterfowl. They're here in the winter, they're here in summer. 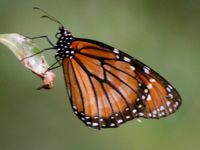 They're also found throughout much of eastern North America, South America, Europe, Asia and Africa. We wouldn't be surprised if one shows up one day in Australia. 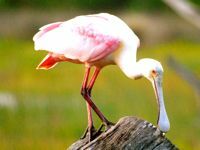 It gets the name from its chicken-like looks and the wetlands where it hangs out. The red "shield" on the face, gray-black body and white wing markings make the moorhen easy to identify. Moorhens are found year-round in the Southeastern United States, and in summer throughout the Midwest and Northeast. 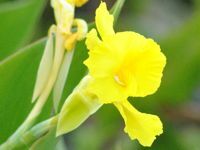 Once common throughout its range, it is now listed as endangered, threatened or as a species of concern in several states, including Connecticut. Habitat loss is the major threat. Moorhens are found in ponds, marshes and canals, freshwater and brackish. It dabbles, dives and pecks for grass and sedge seeds and occasionally other tempting morsels like snails. 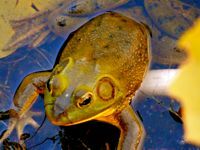 Females will lay as many as 15 eggs in a nest made of grasses, sedges and other vegetation on mounds slightly above water levels. Most of the broods we've seen are considerably smaller, more on the order of two to five. 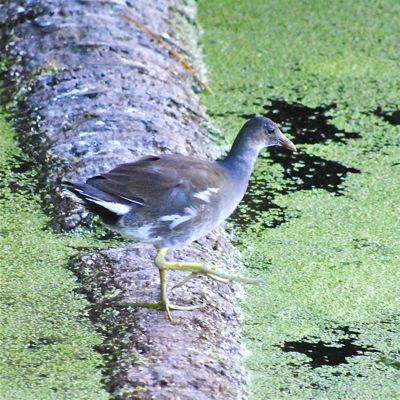 Both parents incubate the eggs, which hatch in about three weeks; young moorhens are capable of swimming shortly after hatching. One thing we've noticed is that siblings from earlier broods often will take part in caring for the young. Older juveniles lack the red shield on the foreheads. Moorhens lack the lobed or webbed feet that many aquatic birds possess, but they are strong swimmers nonetheless. They can be loud birds, with a mad, as in crazy sounding, cackle. They're also fairly large, with a body length of a foot or more and a wingspan that can approach two feet. 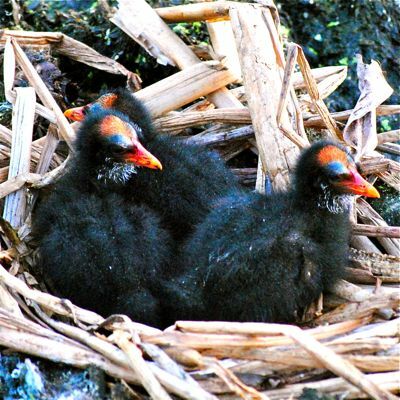 There are 12 recognized subspecies of moorhens; some authorities split into two distinct species, the North American (G. galeata) and the Eurasian (G. chloropus), which have subtle differences in appearance. 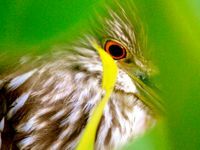 In any regard, they are members of Rallidae, the rail family. 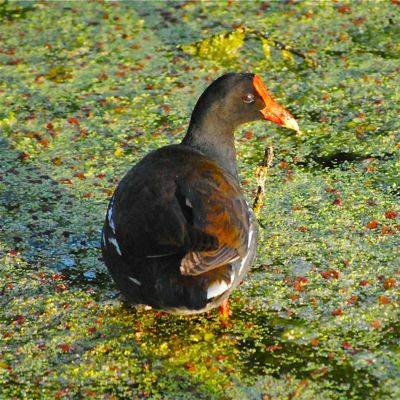 Other names include common gallinule and Florida gallinule.